The light green pickled version of this variety are found in many salad bars, sub sandwich shops and pizza parlors. 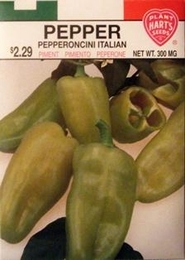 Produces short pendulous yellow green peppers that are more pungent and spicier than the Greek pepperoncini. Hold off heavy fertilization until the first blossom produces a small fruit which is picked off. Pepperoncini plants produce more and better tasting fruit if kept picked and not allowed to ripen. Cut instead of pulling from plant to avoid injury.